The King Cobra is the world’s longest venomous snake. It can grow up to 5.6 metres (18 feet). 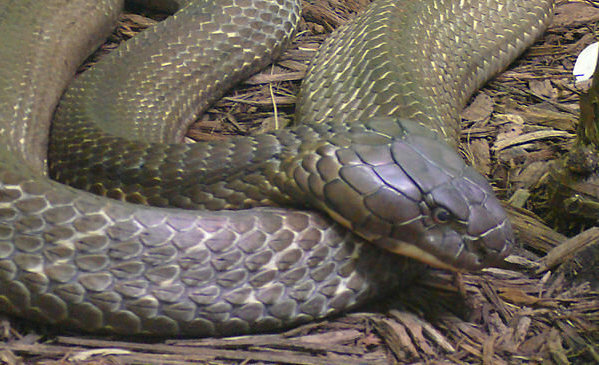 An average king cobra is about 3.6 – 4 metres (12 – 13 feet) in length. It weighs about 6kg (13 lb). Although it is big, the king cobra is quick moving, fierce, powerful and it has very poisonous venom. Every year, there will be people killed by king cobras. It lives in South East Asia and parts of India. It prefers to live in areas which have lakes and streams. Despite its status as a ferocious creature, king cobras are in fact shy. The population of king cobras has dropped because forests are being destroyed, but they are not classified as an endangered species. Adult king cobras are either olive-green, tan, or black and have faint, pale yellow cross bands down the length of their body. The belly is cream or light yellow. Their scales are smooth and shiny but are dry to touch – if you dare to touch them! As for young king cobras, they are shiny black with narrow yellow or white bands crossing the body. The head of a mature king cobra can be quite big. They can open up their flexible jaws wide to swallow a meal which larger than its head. They swallow their food whole because they can’t chew their food. 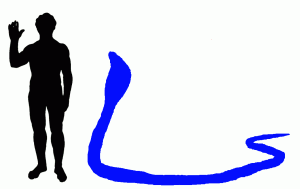 Food in the snake’s stomach is digested by very strong acids. They have two short fangs in the front of the mouth which are used to inject venom into their prey. The length of the fangs are about 1.25 centimetres (half an inch). The venom that goes into the body of their victim will attack its nervous central nervous system and cause terrible pain, blurred vision, dizziness, drowsiness and paralysis. Very quickly, the creature’s heart and lungs stop working and it falls into coma and dies. This all happens very fast – the king cobra is able to kill its prey within minutes with just one shot of venom. The King Cobra is more venomous than many other types of cobra. Compared with other venomous snakes, it can inject a large quantity of venom. It can inject on average about 380-600mg (0.01-0.02 oz) of venom in a single bite. This might not sound like much, but it is enough to kill 20-40 grown men or even an adult elephant! Just one bite can kill a healthy adult human within 15 minutes. The average death time is between 30-45 minutes after being injected by the king cobra’s venom. This is worse than a death sentence without appeal! The mortality rate from a bite can be over 75% or, if correct treatment is given quickly, “only” 33%. Therefore, do not ever get bitten by a king cobra! They are listed as one of the deadliest snakes in the world. There are only 2 places that produce the antivenoms to treat the king cobra’s bite. The first one is the Red Cross in Thailand and the second one is the Central Research Institute in India. Unfortunately both only make small quantities, so the medicine is not widely available. When a king cobra is threatened, it can raise up to one third of its body off the ground, flattening the neck, showing its fangs, hissing loudly and moving forward to attack. It is easily irritated when an animal or a human approaches too closely to the snake. The king cobra attacks quickly and it is able to strike at a distance of 2 metres (6 feet), so people can easily think they are safe when they are not. The king cobra can bite a few times in one attack or bite and refuse to let go. Although it is a highly dangerous snake, it actually prefers to escape unless it is threatened. The King Cobra’s main predator is the mongoose which can actually resist the cobra’s venom. If the king cobra meets the mongoose, it will try to flee. If the king cobra is unable to flee, it will flare its hood and emit a hiss. The male king cobra is larger and thicker than the female king cobra. The average lifespan of a king cobra is about 20 years in the wild. 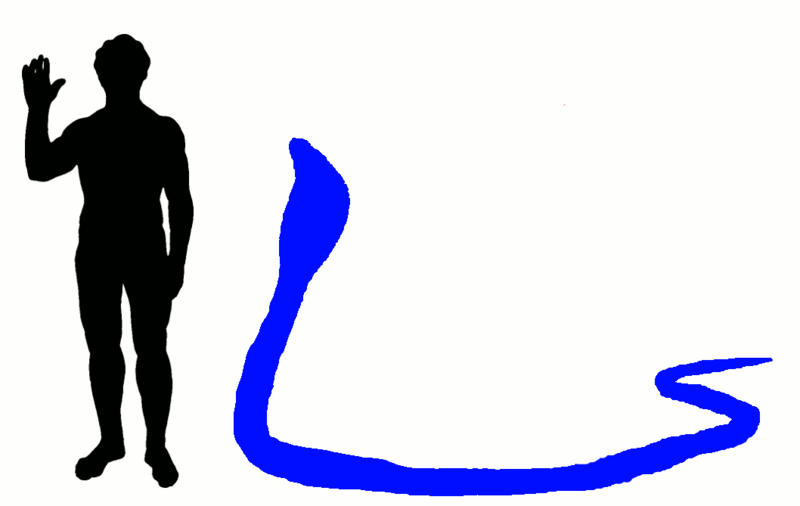 King cobras are bigger than other cobras. It has stripe on the neck like the symbol “^”. This is different from most cobras, which have double or single eye shapes instead. I guess this is because the king cobra is big and ferocious enough that it does not need extra fake eyes to frighten their enemies. King cobras smell with their forked tongues. When the king cobra scents a meal, it will flicks its tongue to locate the prey’s location. It will use its sharp vision to detect a moving animal. It can detect movement from a distance of 100 metres (110 yards). Although they are deaf, they can still sense the vibrations in the ground. That is how it tracks its prey very well. King cobras can hunt anytime – whenever they are hungry. In fact, they are rarely seen at night time. King cobras eat mostly cold-blooded animals, including other snakes. They love eating Ratsnakes and other venomous snakes such as cobras and kraits. When food is hard to come by, they may also eat small animals such as lizards, birds and rats. After a large meal, the snake may live for many months without food because its metabolic rate is rather slow. Since the king cobra’s favourite food is the Ratsnake, and the Ratsnake’s favorite food is Rat, the King Cobra ends up going to where humans live. Therefore, people who live where King Cobras live should always keep their surroundings clean so that rats have no food and nowhere to hide. King cobras are the only snakes in the world that build a nest for their eggs and guard the hatchlings. The mother king cobra is very motherly in nature. She is a very dedicated parent, not like the leatherback sea turtle. She will not abandon her eggs. She lays about 20-40 eggs in the nest. The eggs are incubated inside the mound which the mother king cobra has built at a temperature of 28C (82F). Do not ever go near a nesting mother king cobra because they are extremely dangerous! She will only leave her hatchlings when she needs to find something to eat. The baby king cobras are about 45-55 centimetres long. They are highly aggressive and they are as venomous as the adult!